> Monitoring Health Business – Why Is It So Critical? Monitoring Health Business in Singapore – Why Is It so Critical? Without a doubt, health insurance business is more volatile than its life insurance counterpart. Experience, affected by both internal and external factors, varies drastically between companies. While a good product design, prudent pricing and careful risk selection provide a good foundation for a profitable product, external factors – such as medical inflation, utilization patterns and fraud – may significantly affect the outcome of the business. The product’s external environment is dynamic and ever-changing but we cannot foresee with certainty how the product will be affected by shocks in that environment. What sets one insurer apart from the next is the ability to promptly identify any issues that negatively impact the sustainability of the product and quickly take the appropriate countermeasures to mitigate them. The insurer needs to actively and closely monitor what is going on within the business and its external environment in order to be in good standing to react in any situation. A high-level approach to monitoring health business is to observe loss ratios (paid claims over net premiums received) by accounting period. While overall loss ratios give a broad overview of the results, this approach provides little information about how the product is really performing. Some insurers may be satisfied to see that loss ratios for a given accounting period sit below 100% and see no need to dig deeper into the numbers. This, however, can be a dangerous oversight. Bearing in mind that on an accounts basis premiums and claims consist of a mix of lower- and higher-duration policies, healthy-looking loss ratios may be a result of the initial selection effect and exclusions for certain conditions in early durations. Positive results from earlier-duration policies may draw attention away from the fact that loss ratios for higher-duration policies are well above 100%. This is known as the selection effect. Unlike life insurance, where there is usually little delay in claims reporting following the death of the life insured, medical reimbursement claims resulting from a single event or condition tend to be consolidated and filed several months from the date they were incurred. Therefore claims incurred but not reported (IBNR) need to be considered carefully. Health actuaries estimate the IBNR through the use of various estimation methods and assumptions in order to make accurate estimates of the actual claim liability.2 The IBNR estimate is extremely sensitive to the estimation method and assumptions used. One such assumption is the average delay in reporting time. When business volumes expand rapidly, the insurer may experience a backlog in claims processing as more claims start to come in. The result is a delay in the average reporting time. Since the most recent claims have yet to be processed, paid claims are small while net premiums received are high; hence, simply looking at the loss ratio over the accounting period would give the false impression of favourable experience. In such a case, not adjusting the IBNR assumptions to reflect the delay in claims reporting would result in an understatement of the IBNR claim reserve and consequently lead to reserve insufficiencies when there is a catch-up in claims processing later. 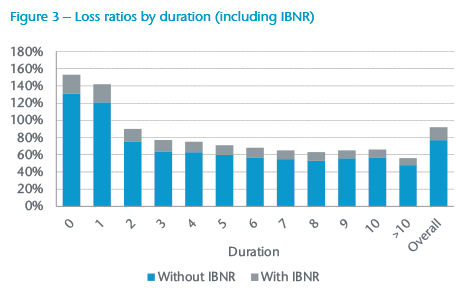 Conversely, a speed-up in claims reporting would result in higher-than-actual IBNR estimates. Figure 1 illustrates what happens when we consider the IBNR. 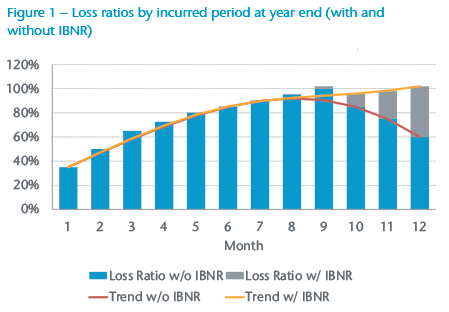 The loss ratios without IBNR imply a misleading downward trend. Considering the IBNR gives a better picture of the result for each period. Though overall loss ratios may look healthy, underlying problems may be overshadowed by cross-subsidy or have yet to make a large impact. In monitoring health business, the claims data represents a treasure trove of information, and digging deeper can reveal valuable insight into what is going on with the product and point us to our quarry. Breaking down and analyzing claims experience by various rating factors – such as age, gender, plan type, duration and distribution channel – tells a more complete story about what is happening within the portfolio by identifying possible red flags. In some cases, these red flags play a crucial role in determining when premium reviews are necessary. Further investigation can shed light on how the premiums should be adjusted, be it a targeted increase for certain groups or an across-the-board increase for the portfolio. The following examples illustrate how examining experience by rating factors helps to identify problem areas. 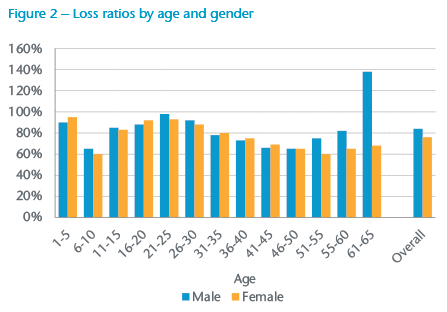 In Figure 2 the loss ratio for males aged 61-65 lives appears to be an anomaly. This raises a red flag, especially if exposures are high at these ages. Several reasons are plausible including volatility, mispricing or a few large claims. Data monitoring helps the insurer identify problems and investigate the claims for males aged 61-65 to determine if there is a need for premium adjustment. Unusually high loss ratios in lower durations also raise a red flag to possible anti-selection. A further look into the claims in Duration 0 and 1 in Figure 3 shows that a significant proportion of claims are a result of not excluding elective surgeries, such as those for cataracts and hernia. The underlying problem here is the product design being out of line with the market, attracting people who would buy the policy to claim for conditions that are excluded elsewhere. One external factor that poses a large threat to the sustainability of a health insurance product is fraud and abuse, which is quickly becoming a huge issue in health insurance markets all over the world. While issues such as anti-selection and elective surgeries can be minimized by introducing stricter underwriting and waiting periods, it is hard to design a product that completely eradicates fraud and abuse. Fraudsters will always invent new ways to exploit the system. It is also difficult to put a price tag to the fraud. Though individual fraudulent claims can be small in amount, the aggregated impact of fraud and abuse can potentially lead to large losses, making it impractical and difficult to impose premium increments to account for potential fraud. The only real solution to containing the impact of fraud is careful claims management and constant monitoring of claims experience. The impact on health insurance experience can be detrimental if fraud and abuse are left undetected and measures are not taken to tackle the problem. Examples of fraud are shown in Box 1. An insurance agent was found to have a high number of claims made within the first few months of customers’ policy commencements. Investigations showed that most were minor, easy-to-fake conditions. The insurer stopped the agent from selling and the fraudulent in-force policies were terminated. Complete evaluation of the performance of a health portfolio should include analysis of several components other than loss ratios on an accounting basis. Taking IBNRs into account gives a more accurate reflection of the actual profitability of a block of business. Experience can be monitored by examining claims data that uses several rating factors in order to provide a better picture of what is happening in the portfolio. Through vigilant monitoring and thorough analysis of exposure and claims, problem areas – such as anti-selection and fraud – can be promptly identified. 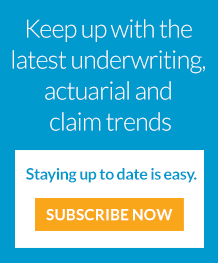 It is key for insurers and actuaries to determine whether such problems should be rectified through product re-pricing (increasing the premiums) or re-designing (introducing exclusions and waiting periods). When introducing a raise in premiums, the insurer is bound to meet with resistance from the regulator as well as consumers. An insurer who has a clear understanding of where the problems lie is in a much better position to justify a premium increase than one who has not been closely monitoring the business. Sometimes, as in the case of fraud, re-pricing or re-designing the product may not be the best solution to rectifying the problem. A targeted response directed at each case of fraud and abuse would be more appropriate. In the case of healthcare providers suspected of over-billing or billing for services not provided, the insurer could blacklist the healthcare provider for future claims. Insurance agents or brokers suspected of colluding with policyholders to defraud the insurance company could have their licenses revoked and the sold policies terminated. Improved life expectancy does not necessarily translate into additional years of healthy life.3 As people live longer, an inelastic demand for medical care increases, especially among the older ages. While assumptions regarding hospitalization incidence and average stay may remain steady over time, the cost of medical care will certainly not remain at its current level. Medical inflation and the trend to seek medical attention overseas mean insurers need to be wary about guaranteeing premiums and need to guard against inflated claims for treatment in countries where healthcare provision is less heavily regulated. At the end of the day, insurers should endeavor to provide financial protection to policyholders and cater to their needs while ensuring the viability of the portfolio–not just in the short term, but in the long run as well. Close monitoring helps to identify problem areas in the portfolio and enables insurers to react promptly and adequately to rectify these issues.